Some of the links below are affiliate links, meaning that at no extra cost to you, I will earn a small commission if you click through and make a purchase. Of course, I only recommend products that I trust and love. 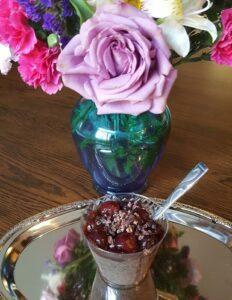 This Cherry Almond Chia Pudding is my all time favorite! Cherry and almond are a perfect combo for this quick make-ahead meal or snack. Rich in fiber and plant-based omega-3. Mix almond milk, 2 cups of cherries, almond extract, dash of salt, maple syrup in blender until blended thoroughly. Add chia seeds and pulse once or twice to blend. You just want to mix the chia seeds into the liquid. Immediately pour mixture into single serving bowls or mason jars. Refrigerate and mix every 1-2 hours until set. Add optional ingredients, if using. Good for 3-4 days in refrigerator. Key Nutrients: calcium, iron, potassium, magnesium, fiber, and plant based omega-3 (α-Linolenic acid).